dilatation and hypertrophy of the colon. acquired megacolon colonic enlargement associated with chronic constipation, but with normal ganglion cell innervation. 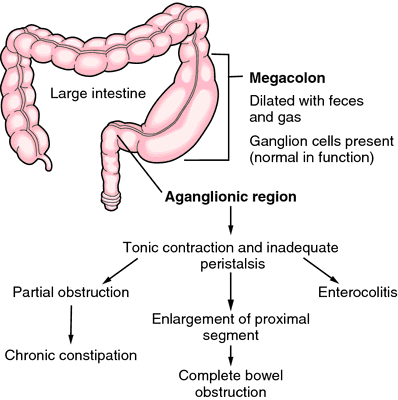 aganglionic megacolon (congenital megacolon) Hirschsprung's disease. toxic megacolon acute dilatation of the colon associated with amebic dysentery or ulcerative colitis; called also acute megacolon. A sigmoid colon of unusual length; a variety of megacolon.